We continue to lose innumerable mothers and children everyday. This is avoidable, only if preventive steps are taken beforehand. In collaboration between the State Government of Bihar, theÂ Bill and Melinda Gates FoundationÂ and theÂ Center for Knowledge Societies,Â The Bihar Innovation LabÂ expects to fulfill the mission at hand by emphasizing provisions for orderly maternal care. Our meeting started off with Jessica Seddon, Sabita Kaushal and Janet Chawla introducing themselves, greetedÂ by BIL representatives Aditya, Shikha and Debonkar.Â A collective brainstorming ensued as solutions emerged resonating with possible outcomes assessed beforehand. We discussedÂ the functional absenceÂ of a localized expertise, with respect to theÂ seasonal spike in the birthÂ deliveries. This in turn triggers an ignorance towardsÂ routine immunizations (in fact,Â counter productive in the long term) owingÂ to a lack of awareness among people and the lack of mobile infrastructure. It was suggested that aÂ better way to communicate would be addressing longÂ term financial rewards post immunization for the mother and child. Likewise, natural disaster such as floods have time and again steered ourÂ thoughts towards building systematic design responses to aÂ cyclical nature of problems, which should also be looked into. AÂ need for more nurses in remote areas is a concern, as there is a peak demand for maternal care seasonally.Use ofÂ existing resources to improve this situationÂ and promoteÂ accountabilityÂ at a centralized level is vital for a sustainable development of the model. Engage! trigger ! create talking point acts. Locate existing informal spots, and drive interest towardsÂ conversations that will stick around for long! B) Document procedures and failures is vital ! ConfidentialityÂ as an issueÂ at a lower level is very important from the point of view of participants who otherwise might hesitate to share their failures fromÂ child birth. No compromise on the speakers obscuring personal experiences should be made as it will effectively serve as ‘a collectiveÂ on immediate issues’ faced by them. Anonymity for the speaker will enableÂ a stream of dataÂ driven models for stakeholders to create Context Responsive Service Strategy and Delivery.Â Documentation of best practicesÂ wouldÂ amount to valuable insights overtime. Re-configuring resources in high volume birthing seasons and making people aware throughÂ campaigns on maternal care should be done well before the ‘birthing seasons’ with effective aid from theÂ State Governments if possible. D) How to enable a smooth transfer of knowledge inÂ this documentation? 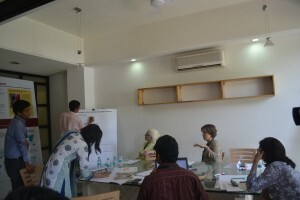 It surely would take time for the participants to speak up andÂ willingly share theirÂ experiences and valuable insights. A word of advice from Janet – Trust building takes patience and time. The path to realityÂ is to chalk the way forward by looking atÂ existing examples of knowledge sharing that are already working across Bihar. With innovation and improvisation at its heart, the workshops being planned should not be rigidly framed but be allowed a consequential space where in, champions are identified in the system. An organic development of innovators will leverage the best talent out there. District officials and States could also be a part of fostering new behaviors and value added assistance. In addition to theÂ agencies outside the health sector who could be looked upon for funding and performance management channeling holistic efforts and trustÂ overÂ time. Well, Bihar is just a start! rather a converging point and a fertile ground which fuels the fact thatÂ there is a pressing need for a radical innovation in Indiaâ€™s public healthcare eco-system. With technological possibilities, innovative thinkers and rapid product – service prototyping on our side, we are on the outset to capture aÂ yet â€˜unrealizedâ€™ potential, in its youngest essence. This entry was posted in Health Public and tagged Aditya Dev Sood, Bihar Innovation Lab, breakout session, CKS, designpublic, Health Public, healthcare, hpub, India, innovation, maternal healthcare, workshop. Bookmark the permalink.